The Quality Dairy on Saginaw Street at Cedar Street in Lansing. Guess what? I needed a Pepsi. I left Oldsmobile Park after a heartbreaking Lugnuts lost and I was really thirsty. I knew there was a Quality Dairy close that I hadn’t been to so I turned the truck around and headed to the Quality Diary. 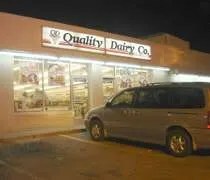 This Quality Dairy is on the corner of East Saginaw and North Cedar Streets. There is actually an entrance off Larch Street as well, but you have to go through a large parking lot to get to the building. The building is weird. The Saginaw Street side sits pretty close to the road. There’s just enough room to park along side the building and the door looks more like a back door than an entrance. There are no windows along that side of the street, but it is actually an entrance. The Cedar Street side looks more like the main entrance with the typical store front. I didn’t know any better and that’s where I parked. When you go inside, the liquor section is off to the left and there’s a cash register back there as well. The fountain pop machine was just off to the right, so I grabbed my cup and filled up. I didn’t eat anything at the ballpark, so I was also really hungry. I had considered just getting a cold meat sandwich like I did a few weeks ago at the QD in Charlotte, but as I was walking to the register, I noticed some pizza that was being sold by the slice. The price was only $1.25 a slice, so I grabbed a paper boat and put a couple slices in there. The weirdest thing about this store was the doughnut case. It wasn’t a self serve like every other QD I’ve been. You actually had to have the clerk get the doughnuts for you. I’ll definitely not be getting doughnuts from this location. That just seems like a waste of everyone’s time. Do they really have a problem with people stealing doughnuts? My pop and two slices of pizza cost just under four bucks. I hopped back in my truck and started heading home. The pizza was easy enough to eat while driving, so I grabbed a slice. It was pretty cold and had obviously been sitting there a while. It was ok, but it wasn’t a pizza that I would write home about. For a quick meal, it was fine, but nothing I’m going to crave or be heading back for. Maybe if it was a little fresher it would have been better, but I doubt it. It’s still amazing how some Quality Dairy stores can be clean and inviting and places you want to go while others fit the stereotypical convenience store mold. Oddly enough this store like the rest is self-serve on doughnuts, open 24hrs, and if the doors that pull towards you weren’t clue enough perhaps asking the clerk if they would serve you would have made it even more obvious. Consider not writing reviews after one too many beers since the entrances are also clearly marked along with being the only brightly lit spots and the parking allows plenty of room to do donuts before parking unless you drive something over 20ft long. I never thought I would find such an evderyay topic so enthralling! Ok, seriously. You’re reviewing convenience store food? The fact that it’s 400 paragraphs is even more annoying. FYI, we have these things called restaurants.